This carpet reducer from Mannington is used to transition flooring over a 1 11/32" length. The carpet reducer has a 5/16" undercut. Use to transition flooring such as glue-down carpet or trim to place against tile. Either way, this quality rubber carpet reducer is made to hold up to high traffic. Transition flooring smoothly with this 1 piece molded reducer that meets the standards for performance of the American Disabilities Act (ADA). Carpet reducer is sold in 12' lengths. A larger area to transition flooring heights can be done by butting two or more pieces together. A smaller length can be done by simply cutting to size. The carpet reducers come in the most commonly used shades of black, browns, blue, and grays. You'll be able to transition flooring heights with a look that will blend in nicely. By scrolling down to the bottom of this page you will find color samples to view. Remember these are not true colors, but a representative color since every computer screen will show colors slightly different. Contact us if you have a question regarding color. Carpet reducers are easy to attach when using Transition Adhesive. Be sure to include either of these to complete your project. Transition flooring heights at 5/16"
To complete your transition flooring project just choose your color and number of 12' sections below. A quantity of 1 means you will receive one of the 12' sections. 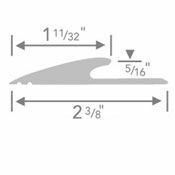 Order additional 12' sections as needed.